Chucks are no longer manufactured in the USA but you can still get made in USA socks in different styles to wear with them. The socks are of high quality cotton blends, normally 80% cotton and 20% polyester. Although some people like to wear chucks without socks, Converse has always recommended that you wear socks with your chucks for greater comfort and foot protection. Want the look of no socks with the comfort of actual socks? “No show” socks are the answer! These socks are great for the gym, walking, or just every day wear. Not only are they super comfortable, but they won't show over your shoes when worn. These are the perfect socks to wear with shorts. When you put them on, they go just over your heel and under your ankle bone. These socks are great for wear with high tops or low cut chucks. Not only are they super comfortable, but they won't show over your shoes when worn. If you want the look of your leg but the comfort of a sock, these are just what you need! They fit just over your heel and below your ankle. They are light thickness and the perfect sock to wear with shorts. These socks are made in the USA from 80% cotton and 20% polyester. The socks come in a package of three pairs. They will fit shoe sizes 9 - 12. Click here to see the photo gallery of these socks worn with high top and low cut chucks. No show socks give you the comfort of socks without hiding your leg. These socks fit in between no show and crew socks. With low cuts you have a mini-sock with half of the height of regular crew socks. With high tops, they give you a little white edge that goes just beyond the canvas uppers. Plush quarter-length socks are designed with comfort in mind. Quarter length socks are medium thickness. These socks are made with 80% cotton and 20% nylon to provide maximum comfort and breathability. Quarter length socks are perfect for sports or everyday wear. 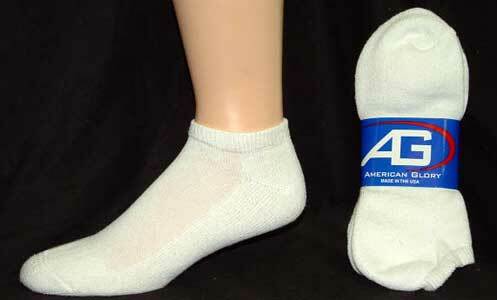 Click here to order all white quarter length socks. All white quarter length and Converse quarter high socks. Another great look you can have to wear with your chucks are embroidered star quarter high socks. These socks have a five pointed blue star embroidered on each side of the sock. These look great with low cut chucks, or with rolled down high tops. See the photo gallery for some views of these socks worn with different models of chucks. Embroidered socks are sold in single pairs. Click here to order embroidered star quarter length socks. Click here to see the photo gallery of these socks worn with low cut or rolled down high top chucks. 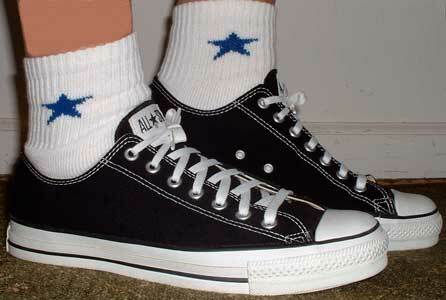 Embroidered star socks worn with black low cut chucks. Embroidered USA logo white socks. These are the socks to wear with jeans or long pants and your chucks. The colored heel and toe crew socks are the perfect addition to your sock wardrobe. Wear these socks for everyday use or working out, they will never leave your feet feeling uncomfortable again. Crew socks also are available with a USA logo. These are great for wear with shorts or other workout clothes where you want your socks to be seen. 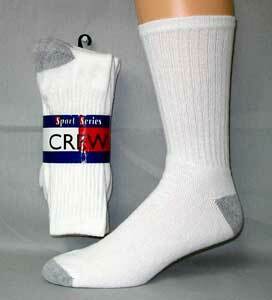 All crew socks have fully cushioned bottoms, reciprocated heels, reciprocated toes, and welted tops. Click here to order crew socks with colored heels and toes. Colored heel and toe and USA logo crew socks. Our store still has a few made in USA Converse All Star Chuck Taylor crew socks remaining in inventory but they are on closeout, so act quickly. The socks are three-packs for younger kids, sizes 2-9. They are Converse All Star premium heavyweight white socks in plain white crew style (no logo) made of 80% cotton and 20% polyester. These are the last of the Made in USA Converse socks manufactured before the bankruptcy. Close out sale. To order these socks, click here. Converse All Star Crew Socks. Over 550 models of socks. Shop 100 Converse Products. Over 1700 models of socks. Shop 398 Converse Products. From Head To Toe - Shop Casual at Eastbay.com! Over 230 models of socks. Shop 159 Converse Products. Shop Famous Footwear now!